If you follow me on social media, you'd know that I recently attended Blogboundcon. It's a book blogger convention that featured panels with different authors, publishers and bloggers and celebrated the 'career path' we know as book blogging. I've learned a lot through my two years of being a book blogger, but it's nothing compared to what I learned from the wonderful panelists during Blogboundcon. So if you missed out on the event, don't fret! I was a good girl, and I took notes that will be shared in today's post. ARCs? What's the big deal? Yeah I know, I know. 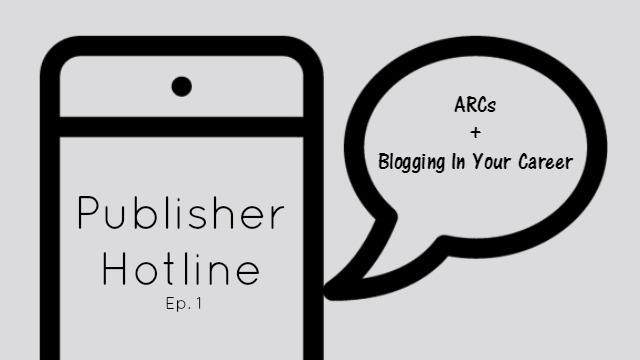 ARCs are now considered a sensitive topic among the blogging community because of the recent mishaps that have unfortunately plagued the blogosphere. This isn't my first post about ARCs but if it's the first for you, just know that an ARC stands for an advanced reader's copy. They are proof copies of books that have not released yet but are sent to librarians, booksellers and book reviewers for early review and hype. Whether you're a new blogger or someone who's been around the block longer than the rest, you can attest to the sheer craziness of receiving ARCs. Because when the ARCs come out, it's really every blogger for her/himself. I'll admit that while I was at Blogboundcon, the main thought that was rushing through my head was 'where are the ARCs? where are the ARCs?' And it's sad really to see what this community has become because of the rarity of these titles and how everyone wants to be the first (or one of the first to read them). You don't have to admit it but you know it's true. I'm not even going to touch upon the recent dilemma or any ARC-mishaps that have occurred. Sure, you can get ARCs for free at book events and giveaways. Those are the most common ways. But what if you actually want to use your blogging stats and social media stats to attain one. Doesn't that sound more like an accomplishment? ARCs are very limited. Okay, not every blogger can receive one, especially if it's for a book that's super popular. And if it's your first time requesting an ARC, you've come to the right place. With the help of the publishers from the panel @ Blogboundcon, I've created a list of things to keep in mind when requesting ARCs. Trust me, you're going to want to stay for this! Requesting ARCs is different for every publishing house. Some use newsletters and Google forms to see which books are requested the most. These newsletters and forms are usually seasonal. Then there are ARC emails, which are probably most commonplace. You know what they say... If you want something, just ask for it! I will be touching upon the emailing process in this post! Request books you really want to read. Remember: There is a very limited amount of ARCs published for a book. Publishers want to make sure that these limited copies are going to readers who will potentially enjoy them. Sure, you're not obligated to love it and write a 5-star review. But keep in mind, publishers want the best publicity for the book so if you request a book you know you're not going to enjoy, how does that help anyone?? Save yourself and the publishers from the disappointment. In your ARC request email, always mention WHY you want to read the book you're requesting. The publishers on the panel said that this was such a common thing that requests were missing. This will help them get to know why you think the book is a good fit for you. They even mentioned how some of the reasons won them over because they were so passionate and heartfelt. If you're requesting an ARC of a book from your favorite author, be sure to mention that! Link all social media (and of course your blog link duh) This should be common sense by now but if you haven't heard it enough times yet, here is your daily reminder! The publishers also said that they basically stalk your Twitter, Instagram and blog links once you send a request in. This will give them a basic idea of how you interact with your followers and that you're not just linking your reviews over and over again, but sharing your love for reading. Don't forget your shipping address. The panelists stressed the importance of leaving your address because so many bloggers often forget! Don't assume that these publishers know who you are! Even if you've received copies from them before, always include your shipping address at the end of your email. Once you receive the ARC, don't disregard the basic directions given to you by the publisher. This is a really important one that people seem to misunderstand. Usually when you receive an ARC that you requested, there are some strings attached. A review is expected, as it is also common courtesy since you literally requested it. If it's unsolicited, that's a different story! It's very common for your ARC to come with a corresponding email or letter with basic instructions and hashtags to allow the book and your review to be shared with maximum exposure. Tagging the publishers and using the given hashtags are great ways to get their attention and let them know that you're doing what you can to get the word out there. They might even consider working with you again! Suggest fun ideas on how to promote the book. The publishers can't do all the work! If you suggest writing something other than a review to help promote the book they might consider giving you the ARC rather than to somebody who just wants to review it. It's all about creativity and imagination. Email etiquette. Be mindful that you are talking to the superiors of the book industry so you have to format your email in a way that is respectful. Start with a greeting. Don't just get into what you want. At the end of the post don't forget to thank the publisher for taking their time to read the email. Don't say the same thing for every email. With all the review requests you're going to be sending, you're going to be tempted to copy and paste everything from one email into another. First of all, that leaves more room for mistake. You might easily forget to change the publisher's name on the greeting and that is just embarrassing. But also, if you send more than one review request to the same publisher. They're going to get tired or reading the same thing or they might notice that you've just been copying and pasting and will think you are a lazy bum. Hehe, that was totally me in the beginning of my blogging career. Don't make demands. Keep in mind that they get to decide whether or not you get the ARC. Don't think so highly of yourself and start demanding ARCs. You're way out of line! In your email refer back to other books you reviewed under their publishing company. Show these publishers that you have a love for their work and you're willing to review some more for them! I wrote this email to Simon & Schuster and received an early finished copy of The Unexpected Everything by Morgan Matson. Can I get a copy of The Unexpected Everything please? I will review on the blog, Youtube channel and Goodreads. I'm a very good reviewer and have at least 500 followers on my blog via GFC. I've also reviewed books for you before like Since You've Been Gone. Please send it before the publication date. What would you ask a publisher for next week's post? Great post! This is very helpful and you give good tips. Sadly, Blogboundcon was not in reach for me, so I did not attend, but hopefully I can go to the next event that happens. I know a lot of people said they learned a lot from the convention, and it is nice of you to share the knowledge. I hope you can make it out to other blogger events and one day we bump into each other! I absolutely value everything I learned on that day and, of course, had to share the wealth. They give such good tips. These are some very great tips!! I do most of them, but I never thought of sharing possible marketing plans and creative ideas. Wonderful post! Thanks Rachel! IKR. I didn't think about bothering the publishers further but after the panel, they said that they love being approached with fascinating ideas about how to further promote the book. These are some great and detailed tips for requesting ARC's! I'm somewhat new to book blogging, so this post was a great insight into one of the biggest topics within the community. That's so sweet. I will definitely check it out! That's really great that you don't depend on ARCs to blog! I love reading back listed books as well because believe it or not there are so many mainstream series that I haven't read yet- i.e. the Graceling trilogy, Harry Potter and The Hunger Games. This is AMAZING advice! I'm a new blogger and have always wondered how I should go about requesting ARCs in the future. I don't think I'm quite there yet (with the followers and everything, I've only just started a few weeks ago), but I plan to continue with it! I can't wait to put these tips to use when I'm a more established blogger. Thanks so much for sharing! I'm really glad this post spoke to you! I wish I had something like this to refer to when I writing my first email because as much as I hate to say it, my first email was more along the lines of something like email 2 (except without the demands lol). If anything, I'm available on Twitter 24/7 if you need to ask anything else. This is such a helpful post, Alex! Thanks for sharing and posting for us! I don't request ARC's that much anymore because they're really not my priority (because, surprise, I like the library more hahaha. Backlist titles are still good too!). I'll definitely take this into consideration :D I like how helpful this post had been! Thanks Jillian, for reading! I do request a lot of ARCs but I mostly end up buying the books I really like in hardback when it comes out. I have so many backlist titles I have to catch up on so I bought a lot of those over recent months. Thank you for your helpful tips! I haven't started requesting ARCs from publishers yet, but I really want to start. Question: What do you do with your ARCs if you have no room to keep them etc? I really hope that no one emails publishers like the second email example... I feel like it's commonsense to write more than that and be more polite. Usually with the ARCs I've read and don't want to keep anymore, I donate them to my local school or public library. You have to be careful about this because some libraries don't take them. But mostly I keep all my ARCs as kind of like a reminder that I reviewed it early, which is probably silly but I just do it LOL! It should strike people as common sense but like the publishers said on the panel, it has happened more times than you would think! YES add those links to social media in there gurl! The publishers said that they use those links to get to know you better and get a better feel of your reading tastes in case they are interested in sending you other books. What a cool post! I've never approached a publisher to request an ARC but I'll keep all these tips in mind for when I do. Thanks for sharing, Alex!!! Of course! I definitely think bloggers should if it's for a book they're really interested in. I try to avoid the ARC drama at the moment. Okay, I admit, I so-very much want to get my hands on some ARCs - I wouldn't be a human book blogger being if I didn't, but... if there is one thing I've learned in my four and a half months of blogging, it's the importance of doing it in the right way and on the right time. And so, I'll wait patiently until that time comes. Ohh you're not that new! I actually requested my first ARC 6-7 months into blogger! I totally understand not wanting to get involved in ARCs just yet. Some of the most popular blgs I know don't do ARCs and just put out some great discussion posts. Your comment was just awesome and it shows me how much hope there is for the blogging community... and so it doesn't become dominated by ARCs. I have only tried requesting an ARC once through email, and then just didn't continue with it later. It didn't help that I didn't have much time for it, or that I keep moving to new places haha. But this post gives some really awesome advice, ones that I haven't heard of actually. Thank you for sharing all these tips! I definitely want to try requesting again after I get settled in! Thank for the advice, tomorrow is my 6 month blogiversary and I would like to start requesting some books. That's amazing, and I wish you the best of luck. I hope these tips help in some way! This is really wonderful thoughtful advice I never thought about before now. Thank you! I'm glad it came off as interesting and new. I hope it helped! Wonderful post. Would you recommend contacting them thru twitter? Twitter is more of a personal outlet for them in terms of direct contacting. I definitely suggest email as a top choice but twitter wouldn't hurt! This was very helpful thank you for posting.